When I made my first japanes stab book for a swap, my husband liked it so much that he wanted me to make one for him. So I promised him to make one. I started working on the book last week when I showed you the covers in my WOYWW post. I finished the book last monday. As he likes steampunk stuff, I made it rusty and old looking. He's quite pleased with his notebook. I did take some progress shots, but not very much. So I won't be able to show you exactly what I did to get this look, but I will try and talk through all the steps. I started out with cardboard covers and stuck some metal foil tape to them. I then embossed those with the Rived Metal folder from the Sizzix Texture Fades Diamond Plate & Rived Metal Set. I then covered them with black acrylic paint and wiped most of it away. Leaving me with this. I love this look, but as I was going for a more weathered steamy look, I figured I would take it a step further and try to go for a rusty look. I first treated the plates with some turkoise paint after wich I went back in with a copper paint. This gave me the greenish weathered look. On the inside covers I did the same paints, but skipped the sandy particles, as I wanted those to be smooth. The inside cover in the above picture has not had the final treatment yet. As a final painting step I covered the paint with some matt varnish to protect it somewhat from wear and tear. I bound the book with the same japanese stab binding technique I used for my previous japanese stab book. Here you can also find a video with me struggling with the japanese stab binding. This time it went much easier, practice does make things better =). 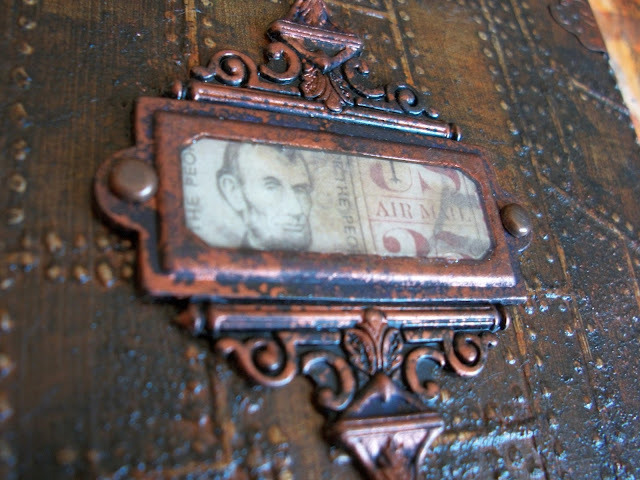 Decorated it with a Tim Holtz Ornate book plate and corners. The book plate was treated with alcohol inks (mushroom and eggplant) after which I dabbed some copper acrylic paint onto it to make it look rusty. I found an Abraham Lincoln picture in my 8"-8" collage mini stash paperpad. cut it out and stuck it behind the book plate with diamond glaze on top. The corners were also dabbed with the copper paint. 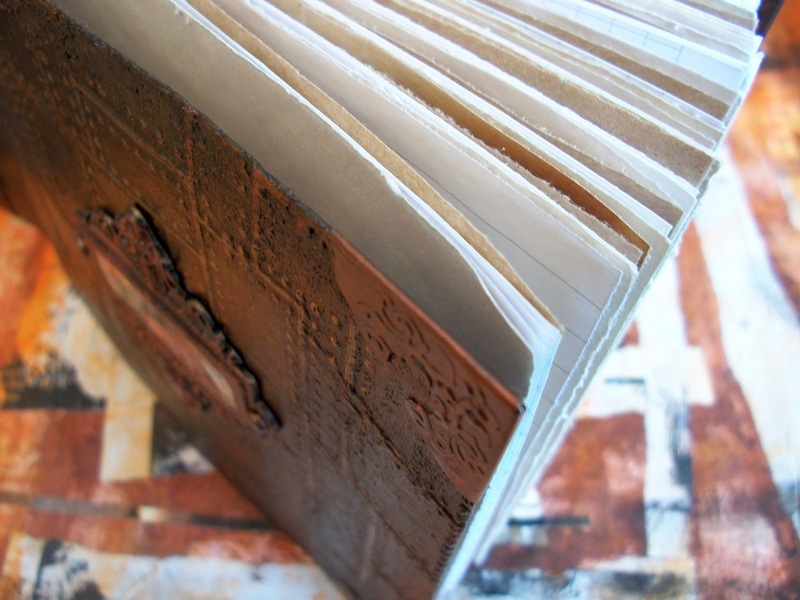 The papers inside the book are a collection of tea dyed papers, brown papers and plain white papers. All cut to size and randomly stacked. Well maybe not so randomly, because I made 9 stacks and build each stack with 9 different papers, so that no adjacent papers are the same. I glued an envelope to the front, so he can keep some stuff in there, stamped on it and called it a day. I had difficulty taking pictures of the book, because inside it was too dark and outside there was to much glare. I do have some pictures that were taken outside. 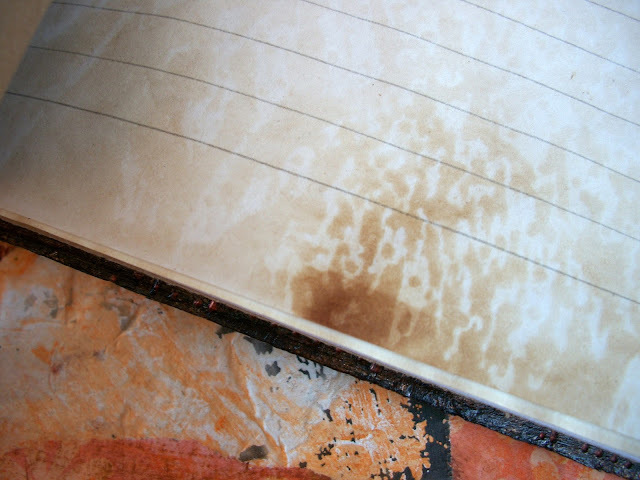 So that's it, my rusty notebook. Or at least I gave it a shot =). I think maybe next time I will just skip the step with the metal foil, because after all those layers of paint, I really don't see the point of the metal foil anymore. It does peek through here and there, so maybe it does add to the overall look. Thank you all for watching and I wish you a beautiful day. 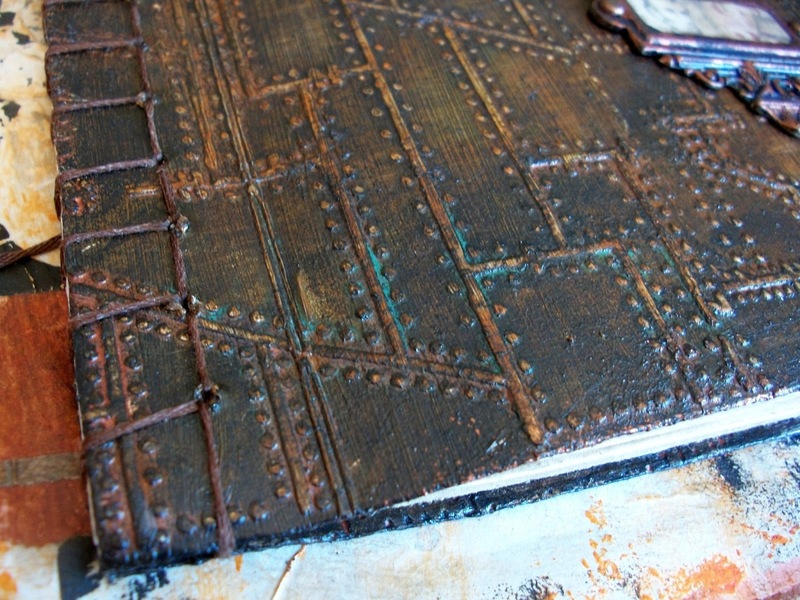 Sandee & Alemlie's steampunk challenge blog: It's all about "RUST"
Gosh, I LOVE this notebook, Monique! Thank you for sharing the HOW TO and your amazing project with us at SanDee&amelie's! 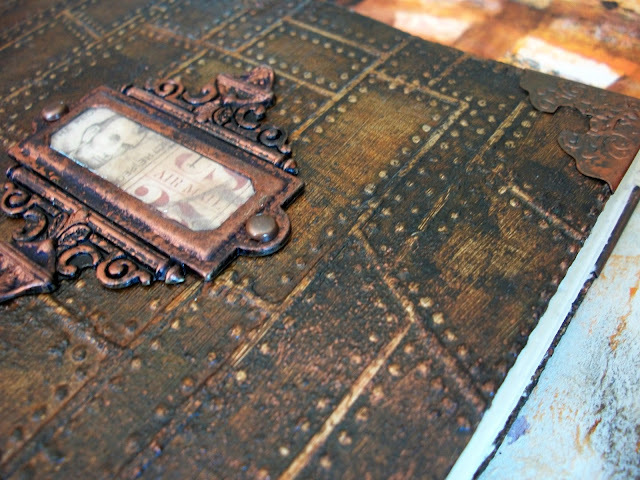 Absolutely stunning handmade book, Monique - wonderful rusty vintage look, and I love the papers inside. Wat een prachtig resultaat Monique, het oogt zo lekker! Wow, I love this book - I bet your husband was thrilled with it. 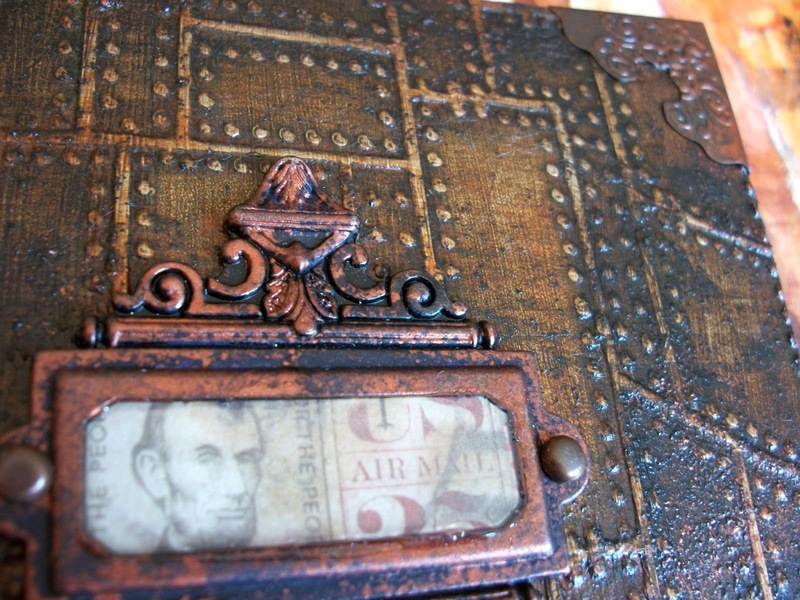 It's very clever how you got the weathered, rusty look - and thanks so much for sharing your secrets! Stunning book, what a fantastic look, totally LOVE it!!! Lovely that your DH appreciates your art. Fab book! "I'd rather be ridiculous than boring"
"People who don't make a mess don't make anything". Oh my GOSH!!! This is absolut awesome Monique! Fabulous! Monique - das ist einfach wundervoll gemacht - so schön!!!! Absolut mein Geschmack. Absolutely stunning, thank you for sharing it with us at TioT's this time. Your book is awesome. I am so glad that I got to see it. What a great take on the challenge! Love how you aged it, fabulous. Thanks for playing with us at TIOT. oh wow Monique that is absolutely marvelous what you have created! Adorbale just love it! This is so insanely cool I am lost for words! Hi Monique, what a fabulous make, love the steps you've used to create the rusty covers, especially adding the black sand! The book looks weathered, old, interesting - I love it. Bookbinding is on my to do list too, I even promised to make a book for my parents. This certainly is more inspiration for it! WOW! This is crazy awesome! Thanks so much for taking us through the steps. I feel like I should go out immediately and try this technique haha! I love, love, love it!! Wow!!! Fantastic book!! I love it! Fantastic! Love the texture you have created.